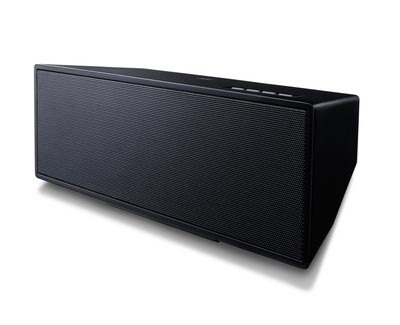 Pioneer XW-BTSA1 | Ambassador Home and Electronics Centre, Inc.
Powered by 2 x 8W speakers, the XW-BTSA1 uses Bluetooth connectivity to play music wirelessly from Bluetooth-enabled devices. Near-Field Communications (NFC) technology lets you easily connect your NFC-equipped device to the XW-BTSA1 by simply holding your smartphone on the contact point indicated on the speaker to create the Bluetooth connection. There’s no need to make complex settings in the device menu. If your smartphone doesn’t support NFC, you can connect via Bluetooth manually. Pair your Bluetooth-enabled device with the X-BTSA1 for easy wireless audio streaming. Pair NFC-equipped devices to the XW-BTSA1 by simply holding your smartphone on the contact point (supports Android 4.1 and above). The XW-BTSA1 has a USB port which can charge your smartphone while you're streaming over Bluetooth.